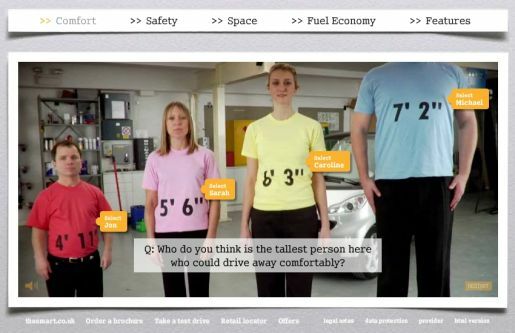 Mercedes Benz UK and Agency Republic have just won a Gold award at the Eurobest Awards for Truth About Smart, today’s site of the day, www.truthaboutsmart.co.uk. Most people think they know all about the smart fortwo. They know it’s a cute and nippy two-seater, but because of its compact size, many people also assume it lacks ‘real car’ credentials, that it will be cramped on the inside and would crumple horribly in an accident. This is actually far from the truth. The boot can take a washing machine and its internal ‘Tridion’ safety cell could survive the weight of 400 elephants. The campaign therefore seeks to make people reappraise smart as a real car with real car credentials, by confronting people’s misconceptions head on. Visitors to the site are invited to explore the comfort, safety, space, fuel effiiciency. Who would you need to call if the Smart car was hit by an industrial wrecking ball? Could you fit a tumble dryer or a piano inside the car? How far could you get on the 33 litre tank, if you started from London? And how long would it take for Pete to list all the features available on the Smart for Two? A couple of interesting touches. As the site loads visitors are shown a chap sweeping the court, with the explanation that Smart for Two cars will arrive soon. Occasionally you’ll see ghost hands and cursors on the screen. It’s meant to be other users of the site. During idle moments the narrator takes a call, orders a cup of tea and a cheese and ham panini. The Truth About Smart campaign was developed at Agency Republic by creative director Gavin Gordon-Rogers, copywriter Jim Stump, art director Richard Hale, designer John Harris, Flash developers Tom Danvers and Robin Wong, project director Christopher Binks and Suzanne Melia, technical developer Carl Huber. Filming was shot by director/producer/editor/sound designer Tim Gardiner via Republic Film with director of photography Simon Maggs.